When I started on my journey for loosing a bit of my jiggle the first things that came up on google was green tea. There is so much on google about its benefits from physical to mental health. It seems like such an easy option to loose weight right? Drink some tea and sit back and watch it drop off. I didn't like tea, I still don't like a cup of earl grey, but over time my palette has became used to the taste of the stuff. I gulped back the first few cups believing that it was a miracle cure but what I actually found out was that it wasn't the green tea making such a huge change. It was actually water consumption. Once I realised that I started to enjoy my green tea. It no longer seemed like a chore to drink it and I came across some amazing flavours. I used to be terrible for drinking, I didn't drink often and when I did it was fizzy. Now I drink so much more than I did and enjoy my morning tea to waken my day. My favourite flavours have to be from Twinings. They make amazing tastes that spice up your drinking time. A flavour for every mood and every taste bud. The first green tea I tried was the peach and cherry blossom. I had such cravings for peach flavoured things when I was pregnant and thought why not give this a shot, after all I had quite library of peach to compare to. I was pleasantly surprised that you could really taste the flavours through it. From there my love of green tea grew to trying all the other flavours. I just adore the caramelised apple one. Its perfect for hitting that sweet craving spot and smells just divine. Salter Caramel also just smells heavenly. They are overly powerful flavours but I do think the scent really helps. Nobody wants to drink something that smells awful right? The fruit ones are fantastic too, really scentful and just as delicious to drink. My favourite of all has to be the pomegranate green tea. Its sweet, has an amazing scent that really makes me feel all happy. When im stressed I reach for a cup of this and sit with a good book and relax. 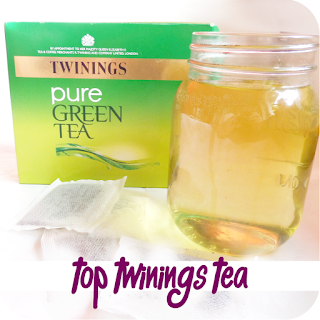 I buy my green tea's from tesco but they are available from Twiningsown website and most supermarkets. There is also a selection pack available on amazon so you can try all the amazing flavours. What's you favourite hot drink? Why don't you let me know down below. I'm definitely tempted to try the salted caramel one! Personally i'm a big fan of blueberry green tea, throw a little honey in there and its like drinking a blueberry muffin! Honestly though, i'm more of a hot chocolate and cream kind of girl overall! I much prefer a nice cup of coffee, but I'd happily go for one of these green teas! The pineapple one is just so good, I really need to start branching out! I really love green tea, and the fact that Twinings do so many special flavours is amazing! I have to try out that salted caramel flavour one - in my head it shouldn't work but I bet it does! Oooo I haven't tried a lot of those teas but I can't wait to try them now! I'm not keen on green tea. I've tried the 'plain' one and flavours and can't say I like any of them very much. My favourite drink is normal everyday tea. Builders, splash of milk and no sugar!! I'm also partial to Cosy Tea Camomile.. you can feel the tension flow out of you when you drink it. Ps please don't leave your links, they will be marked as spam. There are areas already avalible to leave your links. Umber Phoenix. Simple theme. Powered by Blogger.